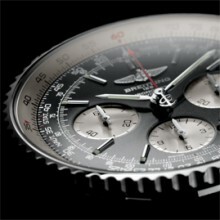 Breitling launches the first Navitimer with a 100% in-house made chronograph movement. Breitling CaliBER 01: a high-performance movement assembled in a revolutionary manner. Featuring an original architecture, the selfwinding Caliber 01 chronograph movement is the crowning achievement of the longstanding quest for precision and reliability that has consistently governed Breitling “Instruments for professionals”. Equipped with a column wheel, a vertical coupling clutch and an over 70-hour power reserve, it was designed to ensure maximum functionality and secure use. It features several innovative characteristics aimed at facilitating its production and its operation, including a patented self-centering device for the resetting hammers and an exclusive index-assembly system enabling swift personalized adjustment of the watch according to the wearer. 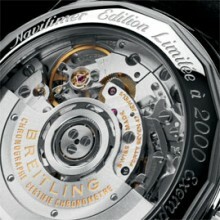 This exceptional caliber is also distinguished by its pioneering production and assembly mode. Inspired by an avant-garde concept used in other cutting-edge sectors, Breitling has developed an industrial chain-production formula that revolutionizes traditional movement assembly. Each caliber is individually monitored by an ultrasophisticated computer program that automatically directs it towards the appropriate workstation, along a route alternating fully automated workstations with others requiring manual intervention. All the adjustment phases are integrated within this process, in such a way that upon emerging from the chain, each Caliber 01 is ready to face up to the stringent tests conducted by the Swiss Official Chronometer Testing Institute (COSC) – a guarantee of authentic large-scale production reliability. Movement : Breitling Caliber 01, officially chronometer-certified by the COSC, selfwinding, high-frequency (28,800 vibrations per hour), 47 jewels. 1/4th of a second chronograph, 30-minute and 12-hour totalizers. Calendar. Limited series in steel or in 18K red gold. Resistance to 3 bars. Rotating bezel with circular slide rule. Cambered sapphire crystal, glareproofed on both sides. Transparent sapphire crystal caseback. Diameter: 43 mm. 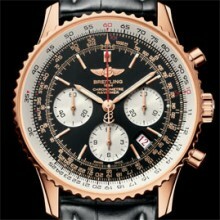 Barenia leather, crocodile leather/Navitimer (steel version only), Air Racer.